We received this brand new game from Joel King last week and have played multiple times, enjoying the strategy as well as the knowledge that we are gaining. 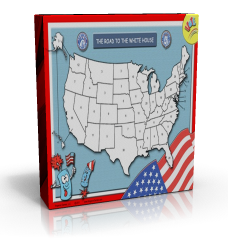 "The Road to the White House" is a fun (and strategic) game where young children (and even adults) will learn the locations of the 50 states and a bit about electoral votes and presidential elections in a way I've never seen before! Components of the game include 1) a laminated map of the U.S. with the states electoral votes, 2) a deck of 56 cards that includes all 50 states and Washington, D.C., 4 regional bonus cards, and one special card that allows you to jump to any state, 3) four crayons, and 4) an instruction booklet. For ages 4-94!